Crucial is one of the biggest brands in memory and has a reputation for delivering high performance products at low prices. 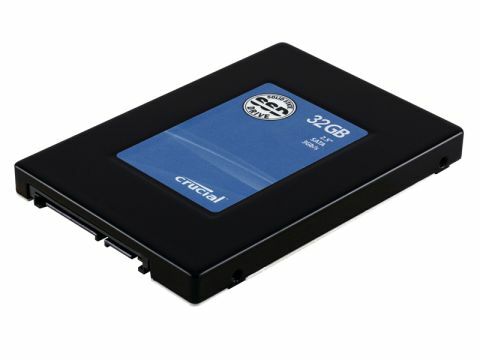 Unfortunately, it misses the mark with this 2.5in SSD drive. At £272, it might be cheaper than the Intel X25-M, but it's also less than half the size. The real problem is performance. The raw benchmark results of 101MB/s sustained read and 42MB/s sustained write are decent enough, but they don't reflect the fact that certain types of random-write operations can bring this MLC-based flash drive to a grinding halt. It doesn't happen often, but when it does, it's extremely tedious. Crucial's SSD makes most sense in laptop PCs, because it often outperforms conventional mobile drives and delivers improved power efficiency. Its solid state internals also mean that it offers superior resistance to knocks, and the relatively modest 32GB capacity is less likely to be a drawback on the move.